23 October 2004: Even before the Communists gained power in 1949, China, the most populous country in the world, while it inevitably required a powerful central government, yet, perhaps inevitably, comprised strong governments at the local level as well. The country’s first communist leader, Mao Tse Tung, made no secret of the fact that he considered the power of local governments something it was for him to calibrate and adjust, giving and taking back as and when he saw fit. Since his death in 1976, China has moved gradually toward a market-based economy that brings with it a relaxation of economic reins on the part of the central government. That same central government, however, continues in principle to exercise the same degree of political control as before. That, of course, means delegation of authority. Among the interactions of what even informed Chinese observers say is a bemusingly complex array of influences, the appearance (or reappearance) of entities and individuals at the local level who wield effective economic power yet who can afford to regard principles, whether politically based or simply ethical, as irrelevant is just one. China, currently with a population of almost 1.3 billion people, has 22 provinces (it considers Taiwan the 23rd), five autonomous regions, and four provinces-municipalities. Hong Kong and Macau are special administrative regions. The county level of administration may represent any of a variety of designations, from county level cities to city districts under provincial control. Then again, the town or village level may mean anything from an autonomous village to something also called a county to a district not under the control of a municipality. ‘Socialism with Chinese characteristics’ and the structure of the government were formulated in the 1954 constitution, which was revised in 1975, and replaced in 1978 and 1982. Real executive power is in the hands of the General Secretary of the Chinese Communist Party (CCP) and of the Premier and the State Council, also called the Central People’s Government, within the National People’s Congress (NPC). The precise dynamics are also very much a matter of the individuals in those offices and their personal followings. For every 400,000 people, a province elects a representative to a five-year term in the NPC, all of them members of the CCP or having the CCP’s blessing. (There are eight other political parties, but they all defer to the CCP.) Its size (2,946 representatives in 2003) precludes the NPC effectively fulfilling its constitutional roles of passing laws, approving the budget, and so on, and the 153-member Standing Committee elected from its ranks does those things for it, and acts on its behalf in a wide range of capacities. The State Council, directed by the Premier, and including Vice Premiers, State Councillors and the General Secretary, department and commission ministers and the Auditor General, enforces the decisions of the NPC and the Standing Committee. It also exercises power over local government. Local representatives of the NPC are called Local People’s Congresses and Local Governments and, in national autonomous regions, Autonomous Offices. Local Standing Committees are produced out of Local People’s Congresses at county level or above. All are supposed to obey the State Council. Local level People’s Courts have lower, middle and higher tiers; laws are enforced by agencies (sometimes translated as procuratores) at Supreme, Local and Special levels, with provincial, autonomous region and municipal procuratores included at the Local level, and cities having jurisdiction over procuratores at county, city, autonomous county and district level. The number of levels of local government has gone from six in 1949 to the current four (province, county, city or municipality and town or village), apart from national autonomous regions and special administrative districts. (In the latter, capitalism continues.) Broadly stated, the purpose of all levels of local government in China is to achieve economic and socioeconomic objectives, including by making short and long term plans for development and acquiring all elements, including money, necessary to those ends, in addition to ensuring rule of law and creating and maintaining infrastructure. City and county governments are headed by their respective People’s Congresses, with bureaus to discharge functions, such as health and statistics, below them, and various other committees (such as of family planning and transport) and, in the cities, offices. Towns and villages also have offices corresponding to a People’s Congress. The election process at all levels is indirect, with representatives to the People’s Congresses elected by the population, and those representatives then electing the holders of the various local government positions. The economic and other development objectives with which each level of local government is concerned are passed down to them from the next level up, and those objectives are ultimately the expression of the goals of the Standing Committee. The way in which they go about achieving those objectives, however, is affected by the fact that each level of local government is also, politically, a complete and self contained entity, so that there are important ways in which it is not constrained by the laws or priorities of the higher levels. Moreover, since the 1980s central government policy has been to encourage growth by delegating ever more authority to the lower levels. 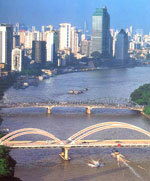 In 1990 Shanghai joined seven other cities, one of which was Guangzhou (see more on Guangzhou below), in being released from provincial rule. On top of that, the provincial governments have themselves found the arm of the central government less and less inclined to reach them, freeing them to improvise their own paths, with often complex and unpredictable added repercussions for the levels below them. A movement towards streamlining the central government was reflected in three major restructurings in 1993, 1998 and 2003, with reductions in numbers of ministries and staff. That streamlining, of course, in turn reflects the liberalizing of the economy. Local revenue in China derives largely from local taxes (including collective enterprise income, agricultural and real estate taxes) and shared taxes (such as individual income, product and business, and joint venture enterprise taxes), and from other sources (such as monopolies, set quotas, and bonds and credits). All financial processes are directly overseen, in theory, by the provincial finance department, but local governments decide their own budgets and develop methods and rules appropriate to local conditions. Local levels of government in China also receive the portion of the central government’s consolidated budget allotted to them. At all levels the budgets are subject to discussion and approval by the People’s Congresses. Budgeted revenue and expenditures of departments of the State Council and of all local governments are also audited by the State Council through offices with branches in those levels, and finances outside the realm of the budget are operated through a graded management system. The term cadre is often used, individually and collectively, to refer to what in English speaking and non-communist contexts would probably be called civil servants. Cadre filling government, including local government, ranks, including the position of mayor (the mayor’s is not the highest office in Chinese cities; he answers to the City Secretary) are chosen, managed, dismissed and punished by CCP committees. ‘Management’ in this sense includes management of cadre’s way of thinking, and cadre themselves are not necessarily CCP members. Those cities include Beijing, the capital, Guangzhou, Shanghai and Shenzhen. Economic success in those places has led to a burgeoning and ambitious middle class, including a wide range of skilled workers, executives, entrepreneurs, intellectuals and white collar workers. While the government’s point of view is that this middle class is still not as big as it would like, and it appears to be officially encouraging migration to cities by rural residents further west, the extent and depth of the poverty, especially among 28 million farmers, is another immense challenge facing China. Those are the ones who have not moved to cities; very many rural hopefuls who have done that in search of a better paying job, or any job at all, often leaving dependants behind, are acknowledged as having found instead a new venue for old misery, and this year (2004), the government announced the first increase in poverty in China since the economic reform movement was initiated in 1978. It has even instituted a new department to address the issue, and the aforementioned central auditing organ said that about ten per cent of the already extremely large financial resources directed to the stricken and backward western regions has gone down the drains of inefficiency and embezzlement. An important part of economic reform in China is the restructuring of state owned enterprises (SOE), and the introduction of employee ownership into the reform of ownership in township and village enterprises. Stock based employee ownership, however, is seen as an innovation necessary for that restructuring, and has had little support from the central government not only for ideological reasons, but because of an ingrained belief in the factory manager system and in the idea that greater efficiency can be achieved without redesigning ownership. Stock based employee ownership has, therefore, grown most prolifically at provincial and, in particular, local levels. Rules governing employee ownership conflict with State Council laws and policies, but they carry on anyway, a fact only made possible by administrative decentralization. That has meant that provincial and local governments have become, in effect, the owners of the SOE in their jurisdictions. Since it is a socialist given that every citizen is a part owner of state owned enterprises, the central government is the single owner of all SOE and, perhaps, of the whole economy. Since that cannot be realized practically, the provincial and local governments continue to have SOE as their major source of revenue, thus making China, economically, a federation. Unfortunately for many village employees and workers themselves, though, the role of their ‘ownership’ in the ownership restructuring benefits them little, because ordinary employees either get no shares (they all go to managers and government officials), or the distribution of shares is a matter of their position in the company, or they relinquish control of their shares to their managers. The result is the control of the local economy by what amounts to a new local economic aristocracy. The municipal governments of Shanghai and Beijing, more optimistically, took measures in 2003 to increase government transparency, Shanghai by instituting a spokesperson system for various offices and holding biweekly press conferences, and Beijing by also requiring departmental spokespeople to be appointed. The municipal government of Guangzhou recently passed the Guangzhou Municipal Provisions on Open Government Information, the first legislation in China with the purpose of establishing transparency in government. Non-disclosure has always been the rule in China; Guangzhou’s intention is, as far as possible, to eradicate it, thus putting Guangzhou ahead, even, of efforts within the NPC to do the same thing on a national level. It should not be thought, though, that these trends are encountering anything but massive resistance within the CCP, the NPC and the State Council. At this point, freedom of information remains overwhelmingly rare. Even the advent of the internet in China, with many municipalities having their own websites complete with archives, does not mean the flow of information is not carefully controlled. International pressure, and not only through the WTO, may be instrumental in making a local experiment a national model, and it is unlikely to be a coincidence SARS, for initial secrecy over which China was internationally berated, is thought to have been born near Guangzhou. Another first in 2004 was an international financial forum in May in Beijing, sponsored by the Beijing municipal government, the People’s Bank of China, and four state commissions. In addition to being the first such forum of its prominence to be held in China, it is the first time the national auditing office has so cooperated with a local government. A number of cultural and information exchanges in the realm of local government are occurring between China and more developed nations. The Carl Vinson Institute of Government’s International Center for Democratic Governance at the University of Georgia, for instance, sponsored a visit by community development teachers and practitioners from Shanghai to Georgia and to Washington, D.C. as part of a special training programme to introduce them to ways citizens can take more responsibility for their own affairs. In 2000, a Memorandum of Cooperation was signed by the China Association of Mayors and the United States Conference of Mayors with a view to holding a series of conferences and facilitating information exchange. The China Integrated Municipal Development Project is an undertaking of cooperation between China and Canada that began in 1999. It is being implemented by the Federation of Canadian Municipalities and the Chinese State Council for Restructuring the Economic System, and focuses on helping Chinese municipalities to improve their public management capacity, public participation and legislative development in the environmental field, and public and economic management in the urban sector. In the project, which was scheduled to be completed this year, Chinese municipalities can apply for nine model projects with the purpose of improving a Chinese municipal department’s ability to manage and deliver services to its community. In the Building Knowledge stage, for example, Canadian experts share their knowledge with the model project team. The team visits Canadian sites, and is introduced to Canadian methods and technologies in relevant areas.